The rover has several cameras focused on engineering and science tasks. Some help us land on Mars, while others serve as our “eyes” on the surface to drive around. We use others to do scientific observations and aid in the collection of samples. Ever wonder what it would be like to have an "astronaut's" view of landing on Mars? When the Curiosity rover landed on Mars, it recorded the descent and landing with its Mars Descent Imager or "MARDI" camera. The view was extremely valuable to engineers; it helped them understand what happens during one of the riskiest parts of the mission. This camera shot full-color video of Curiosity's journey through the atmosphere all the way down to the Martian surface. It gave the science team and rover drivers a glimpse of the landing site to aid them in accurately identify Curiosity’s landing spot and plan the rover's first drives. For the Mars 2020 rover, the engineering team is adding several cameras and a microphone to document entry, descent and landing in even greater detail. They will shoot full-color video of Mars 2020 throughout its descent to the Martian surface. Some of what the cameras see on the way down will help mission planners decide on the rover's first drives. These new eyes and ears of the rover are assembled from easily available commercial hardware. The cameras and microphone are being flown as a "discretionary payload," which means it's an optional add-on that will be an asset, but is not required for the mission. The team expects that the entry, descent and landing cameras will capture better-than-ever recordings of the events that deliver the rover to the surface of the Red Planet. In addition to providing engineering data, the cameras and microphone can be considered "public engagement payload." They are likely to give us a good and dramatic sense of the ride down to the surface! Memorable videos depicting Curiosity’s "Seven Minutes of Terror" during its entry, descent and landing on Mars rover went viral online, but used computer-generated animations. No one has ever seen a parachute opening in the Martian atmosphere, the rover being lowered down to the surface of Mars on a tether from its descent stage, the bridle between the two being cut, and the descent stage flying away after rover touchdown! What happens when the rover lands? How much sand and rock is blown into the atmosphere by the retro rockets? How does the landing system move as the rover nears the surface? 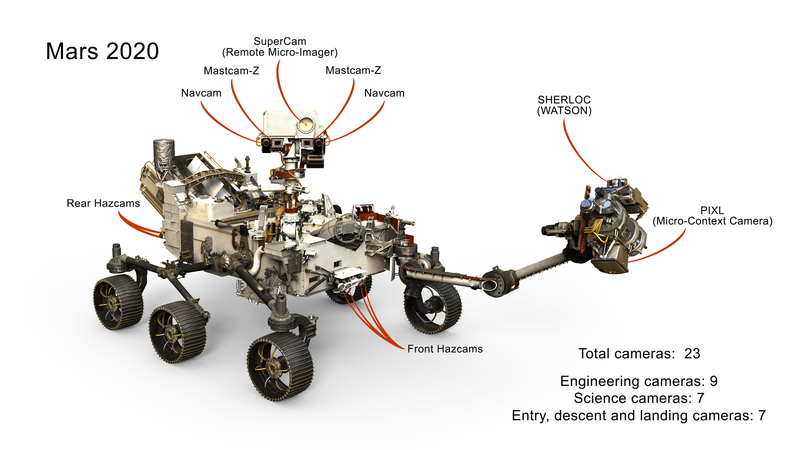 How do the wheels and legs respond when the rover finally puts all its weight down on Mars? These are some of the most informative observations that the cameras can provide for engineers in the business of landing spacecraft on Mars. Mars 2020 will give us all a front-row seat in a Mars landing for the first time in the history of space exploration. MAIN FUNCTION: Take pictures, looking up and down, during descent through Martian atmosphere. Location: Mounted on the fore-port-side of the rover, pointing toward the ground. Mars 2020 uses a new generation of engineering cameras that build on the capabilities of past Mars rover cameras. These "enhanced” engineering cameras give much more detailed information, in color, about the terrain around the rover. They have various functions: they measure the ground around the rover for safe driving, check out the status of rover hardware, and support sample-gathering. Some help determine the best way to move closer to scientific targets. The enhanced engineering cameras for driving help human operators on Earth drive the rover more precisely, and better target the movements of the arm, drill and other tools that get close to their targets. A much wider field-of-view gives the cameras a much better view of the rover itself. This is important for checking on the health of various rover parts and measuring changes in the amount of dust and sand that may accumulate on rover surfaces. The new cameras can also take pictures while the rover is moving. The enhanced engineering cameras share the same camera body, but use different lenses selected for each camera's specific task. These Mars 2020 navigation camera, or NavCam, views show a pile of rocks taken from a distance of about 15 meters (about 50 feet) in the "Mars Yard" testing area at JPL. The pictures illustrate one way the camera data can be used to reveal the contours of a target from a distance. Such measurements give the rover and its team the knowledge they need to plan precise travel and arm movements. Mars 2020 carries six newly developed Hazard Detection Cameras, called HazCams: four on the front and two on the rear of the rover body. HazCams detect hazards to the front and back pathways of the rover, such as large rocks, trenches, or sand dunes. Engineers also use the front HazCams to see where to move the robotic arm to take measurements, photos, and collect rock and soil samples. When driving, the rover stops frequently to take new stereo images of the path ahead to evaluate potential hazards. The 3D views give Mars 2020 the ability to make its own decisions about where to drive without consulting on every move with the rover team on Earth. Two sets of color stereo Navigation Cameras, called NavCams, help engineers navigate Mars 2020 safely, particularly when the rover operates autonomously, making its own navigation decisions without consulting controllers on Earth. Located up high on the rover's mast, these two sets of black-and-white stereo cameras help engineers drive the rover around Mars. They can see an object as small as a golf ball from 82 feet (25 meters) away. Before Mars 2020 "drives blind”, the navigation cameras initially help ensure a safe path. Blind-drive mode occurs when engineers command the rover to drive a certain distance in a certain direction, and the rover's computer "brains" calculate distance from wheel rotations without looking or checking for wheel slippage. The "CacheCam" is a single camera that looks down at the top of the sample cache. It takes pictures of sampled materials and the sample tubes as they are being prepared for sealing and caching. This helps scientists “watch over” the samples as they are being obtained, and keeps a record of the entire process for each sample collected.